Simcoe Ontario Plumbing - Ed Verboom Plumbing Ltd. 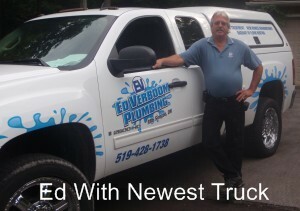 Welcome to Ed Verboom Plumbing Ltd! Ed Verboom Plumbing was started in the fall of 1981 with just Ed and a 12yr old pickup truck and a few power and hand tools. But he had a lot of ambition. Over the following years, some good and some bad, he slowly grew the business. The business started out doing strictly new residential construction and slowly diversified into service, light commercial, industrial maintenance, sewer and drain cleaning, gas waterheater and boiler service and installation. In recent years we have added complete water treatment solutions and hot water radiant floot heating. We are also starting to get involved in solar hot water systems. We now have a permanent staff of 10 with seasonal increases, 5 trucks on the road and sales of 1 million+ per year. Copyright © 2008-2019 Ed Verboom Plumbing. All rights reserved.